Well, that’s what my lovely husband has been saying every time he’s seen me knitting these socks. 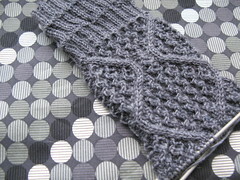 This was really fun and I will definitely knit a pair in stages like this again, it really helped. They’ve been worn and are very toasty. I have to say I’m very impressed with the yarn and am glad I’ve got some more in stash. Hope you had a good Socktober.